When you live in Miami (or any tropical location), the best way to update your wardrobe for each season is to play with colors. 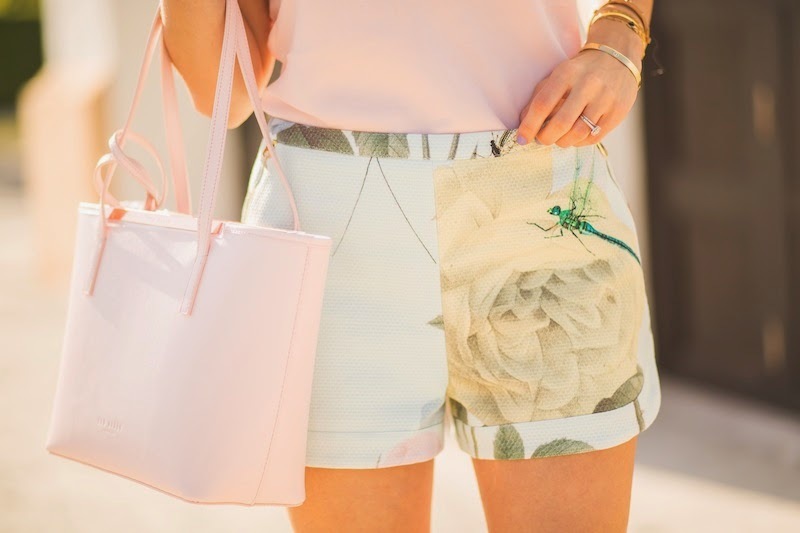 When I think of Spring, I always think of pastel colors and fun floral prints. I think Ted Baker always has the best original prints for Spring….and I couldn't help with fall in love with the latest collection (with has the coolest Instagram campaign!!). The #Pinch_Me campaign pictures have hidden messages and figures that appear when you play with the Instagram filters. The best part if you enter, you can win a trip to Portmeirion (where Ted's SS15 campaign was shot) and win tickets to premier music Festival Number 6. 1. Follow @ted_baker on Instagram. 2. Look out for our SS15 images & read the caption for a clue. 4. Upload your image to Instagram. 5. Explore your filters and settings to reveal the hidden message. 6. Post to Instagram using #Pinch_Me. Al vivir en Miami (o en cualquier ciudad tropical), la mejor manera de cambiar tu guardarropa cada temporada es jugar con los colores. Cuando me dicen Primavera, me imagino colores pasteles y estampados florales. Siento que Ted Baker es el mejor cuando se trata de estampados primaverales, siempre termino entrando a esta tienda en esta temporada. Por cierto, ¿vieron la nueva campaña? Me parece genial el uso de Instagram…las fotos de la campaña revela mensajes e imágenes escondidas cuando juegas con los filtros de la aplicación. Pero eso no es todo, si sigues los siguientes pasos, puedes ganar un viaje a Portmeirion donde hicieron las fotos de la campaña). 1. Sigue a @Ted_Baker en Instagram. 2. Busca las fotos de la campaña SS15 y lee la pista. 3. Toma una captura de pantalla. 4. Sube la foto a tu instagram. 5. Juega con los fieltros y verás los mensajes escondidos. Disclosure: This post was sponsored by Ted Baker; all opinions are made and it has not been edited by third parties. the shorts are the necklace are so pretty! Love this spring ready outfit. this is such a cool idea for a giveaway! Music Festival Season Giveaway on my Blog! Me encanta el estampado del short porque no es típico estampado floribundo y algo cursi. Check out my SPRING BREAK GUIDE with essentials and things not to forget! So beautiful outfits and bag. I'm obsessed with your shorts! So pretty! I love love the heels, they are soo pretty and dainty!